U.S. Patent No. 2016/0201888As described in patent application “Audience Interaction Projection System,” Disney intends to create a live audience experience at its Star Wars Land, wherein audience members can participate in a fight using realistic Lightsabers. The “particulate matter” air above the audience will be filled with water vapor, condensed water, liquid nitrogen, dust, and theatrical fog. Some audience members will be provided with faux Lightsabers, which include LEDs to transmit IR light toward drones. Then when an LED is turned out, the saber transmits IR rays towards the drones, which have IR sensors that capture the image of the field of view with a bright spot at the position of the activated LED. Then the drones project visible light through the “particulate matter” air toward the faux Lightsaber, creating the illusion that the faux Lightsaber has deflected a laser beam. Some audience members would also be wearing a haptic feedback vest with multiple transducers to provide haptic feedback to their body when “hit” by the “laser beam” from the faux Lightsaber. 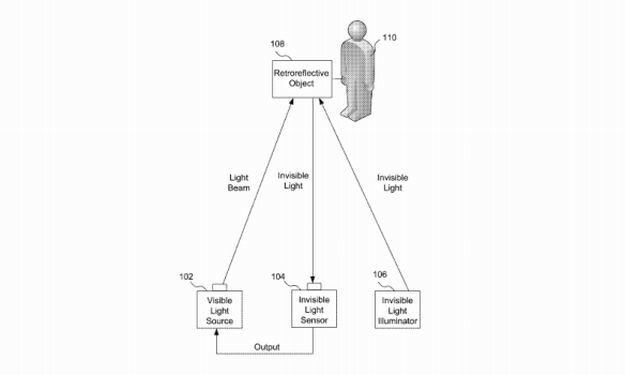 This patent application shows Disney’s attempt to create more live-audience interactive attractions with more innovative technologies. Star Wars enthusiasts are definitely looking forward to seeing this attraction come to life.